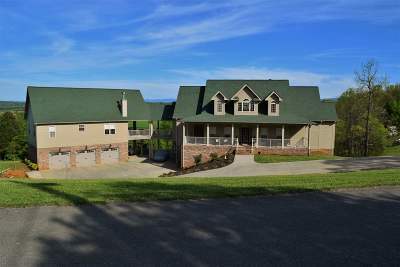 Beautiful custom built home with views overlooking Douglas Lake and the beautiful Smoky Mountains. This 4 bedroom, 3 1/2 bath home has an open floor plan and also includes a very spacious 2 bedroom, 1 bath adjoining apartment with a separate entrance. Both the home and apartment have beautiful stacked stone fireplaces which lend a warm rustic touch! Home was built using quality materials such as Hunter ceiling fans, Corian countertops, Kohler fixtures, Payne HVAC, and stainless GE appliances. The roof was replaced in 2012, new garage doors in 2012 and new siding in 2013. The basement is plumbed for additional living space as large as main floor with windows all along the back and it&apos;s own covered patio to enjoy mountain/lake views. Convenient to the interstate, shopping, dining and recreation. Additional parcel is also available.